It’s April, and Frog thinks Toad should get out of bed and have fun with him. Toad has other ideas in Frog and Toad Are Friends, the first book in an award-winning series about a pair of amphibian best friends who enjoy gentle pleasures such skipping through meadows and swimming in a river near their neo-Victorian cottages. 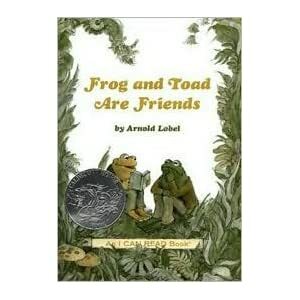 One-Minute Book Reviews will have a review of Arnold Lobel’s modern classic on Saturday. Why have male artists won twice as many Caldecott medals as their female contemporaries? I suggested a few answers in my post “American Library Association to Little Kids: Women Are Second Best.” And I’ve since created a one-page display on Pinterest of the covers of 10 picture books by women that lost the ALA’s annual award for “the most distinguished American picture book for children.” Among the books passed over for the prize: Virginia Lee Burton’s classic Mike Mulligan and His Steam Shovel and Barbara Cooney’s Miss Rumphius, winner of the American Book Award. All have good company in the Caldecott judges’ reject pile, including Dr. Seuss, who won three Honor awards but never the medal. What other titles belong on my Pinterest list? Bumble-Ardy. By Maurice Sendak. Michael Di Capua/Harper Collins, 40 pp., $17.95. Maurice Sendak has often spoken of his admiration for William Blake, and in his latest book he develops a variation on the poet’s idea that “joy and woe are woven fine” in human life. Or, in this case, porcine life. Bumble-Ardy transposes into a darker key a brief animated segment that Sendak and Jim Henson created for Sesame Street in 1970. Its hero is no longer a boy who throws a birthday party for himself on a whim while his mother is out. Bumble-Ardy is an 8-year-old pig who has survived the slaughter of parents who never gave him a birthday party. He lives with his adoptive aunt Adeline, who can’t see that he wants a big celebration when he turns nine. So he invites a group of swine to a masquerade after she leaves for work. He soon finds their sty full of costumed revelers — a jester, a pirate, Louis XIV and others – whose carousing turns into a six-page bacchanal reminiscent of the “wild rumpus” in Sendak’s Where the Wild Things Are. The party’s over when Adeline returns and threatens to turn the outsiders into ham if they don’t leave. Sendak’s pictures express an idea larger than that of a birthday party gone haywire: the irretrievability of time. Bumble-Ardy brims with images of objects found in vanitas paintings, those symbol-filled art works about the transience of earthly life, or in their modern counterparts. His frontispiece and title spread show a birth certificate, a June 2008 calendar and the “Hogwash Gazette” along with pictures of Bumble-Ardy’s dead parents. Nearly every subsequent page has a memento mori, such as a skull, or another traditional symbol the brevity of life — a watch, mirror, dead flower, flickering candle, musical instrument, broken plate or a number representing minutes, days or years. But Bumble-Ardy is at heart the story of a lonely and misunderstood pig who is — as child psychologists say — “resilient.” Its hero doesn’t sulk when nobody gives him a birthday party. He plans one for himself. And he tries desperately to please an aunt who is furious afterward: “I Promise! / I Swear! / I Won’t Ever / Turn Ten!” Adeline covers him with kisses, so the story ends happily enough, but Bumble-Ardy’s plight remains sad. He copes by denying reality: He “won’t ever” turn ten. Best line/picture: The six-page of the bacchanal, which includes visual references to Sendak’s earlier books and to those of other artists. Worst line/Picture: Sendak says of Bumble-Ardy’s fifth, sixth, and seventh birthdays: “And five six seven just simply were not.” The line is wordy: It didn’t need both adverbs, “just” and “simply.” And the story includes an inherent contradiction. The book casts Bumble-Ardy as a young pig, but eight years old isn’t young for a pig: It’s at least middle-aged. Furthermore: Sendak won a Caldecott Medal for his picture book, Where the Wild Things Are, which One-Minute Book Reviews reviewed in its “Classic Picture Books Every Child Should Read” series. Bumble-Ardy is the first book that he has written and illustrated since Outside Over There in 1981. You can follow Jan (@janiceharayda) on Twitter by clicking on the follow button in the sidebar on this site. 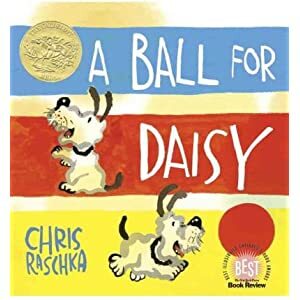 You may also want to read “American Library Association to Little Kids: Women Are Second Best,” a post about male artists’ dominance of the Caldecott awards. Mouse & Lion. By Rand Burkert. Pictures by Nancy Ekholm Burkert. Michael Di Capua/Scholastic, $17.95. 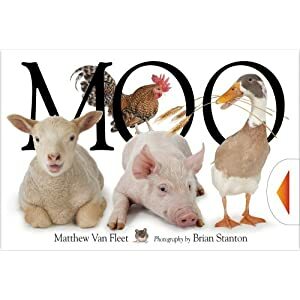 Ages 3–6. Nancy Ekholm Burkert established herself as one of America’s great illustrators of children’s books with her art for the original 1961 edition of Roald Dahl’s James and the Giant Peach. She has held that distinction for 50 years – along with Maurice Sendak, Chris Van Allsburg and a handful of others – and is perhaps the country’s best living female picture-book artist. Ekholm Burkert works in the fine-art tradition of nuanced and often symbolic paintings, an approach pioneered by illustrators such as N.C. Wyeth and Arthur Rackham. She excels at re-interpretations of classics, which have included Snow-White and the Seven Dwarfs, a retelling of a Brothers Grimm version translated by Randall Jarrell. In Snow-White and elsewhere, Ekholm Burkert shows a deep understanding of how far you can go with ageless tales without betraying their spirit. Unlike artists who simply graft modern clothes or speech onto classics, she works from the inside out. She brings to each book a unity and originality of vision that extends to the most arcane detail. The dwarfs in her Snow-White aren’t elves or gnomes. They are real people, based on research suggesting that the tale may have roots in a medieval incident involving dwarfs. This approach gives Snow-White a warm humanity and depth that most versions lack. Anyone who doesn’t know Ekholm Burkert’s work will find an excellent introduction to it in the elegant Mouse & Lion, her first picture book since Valentine & Orson in 1989. Capably written by her son, Rand, this retelling of Aesop’s “The Lion and the Mouse” sets the fable in the Aha Hills on the border of Botswana and Namibia. Ekholm Burkert gives the tale a baobab tree and a tawny African grass mouse with black and white stripes. That is where another artist would have stopped. Ekholm Burkert goes further. Her book shows, perhaps better than any other, that this story is about the mouse, who is the protagonist to the lion’s antagonist. Most versions have both animals on the cover or just the lion. This one has only the mouse on the front. The lion is on the back. Mouse & Lion is original in other ways. Many artists treat Aesop’s fable as a stern tale that instructs: Be kind, and others will repay you for it. Ekholm Burkert sees the humor in the story: The king of beasts needs help from a tiny creature in freeing itself from a hunter’s snare. This and other aspects would be comical in real life, and her pictures show it. In a witty series of images, the regal Lion treats Mouse like a court jester: He demands that his captive show he’s brave enough to repay the favor of a release. Lion laughs when Mouse tries to perform acrobatics on a blade of tall grass that breaks, an act that lands him on his head. The king-and-vassal relationship changes after Mouse gnaws a hole in the snare that has trapped Lion, and the book gains a second theme — the joy of small things — in closing pages that show Mouse’s mate and their babies and Lion admiring ethereal African flora and fauna. If the fable traditionally casts kindness as a duty or means of self-preservation, this one shows that it is also pleasure. Ekholm Burkert admires Asian art, and more than her earlier books, Mouse & Lion shows its influence on her work through its agile lines and expansive use of white space. At the same time it retains the virtues of her earlier books: the subtle color sense, the superior draftsmanship and the rich textures — on the grain of a boulder, the fur on a mouse, the wings of a butterfly. Rand Burkert notes in an afterword that the lion was Aesop’s favorite “character,” and Mouse & Lion is the rare retelling that makes you see why. Best line/picture: No. 1: Mouse returning to his mate and their six melt-your-heart babies. No. 2: Burkert has found an subtle way around a challenge : the difficulty of showing in a single image actions occurring at different times. She uses an airy blue to show things that have occurred or will – for example, the pendulum route Mouse has swung above Lion’s jaws. Worst line/picture: None, but Rand Burkert has a heavy hand with exclamation points. Do you really need them after “A net dropped and twisted around him!” and “ ‘Ah yes!’ he thought”? Recommended? This beautiful children’s book may also appeal to adults who admire fine-art illustration. I liked Jerry Pinkney’s almost wordless 2010 Caldecott winner, The Lion & the Mouse. But Mouse & Lion offers more insights into the fable, and the two retellings are so different that many people will want to read both. Furthermore: Publishers Weekly named Mouse & Lion one of the best picture books of 2011. Nancy Ekholm Burkert won a 1973 Caldecott Honor for Snow-White and the Seven Dwarfs. 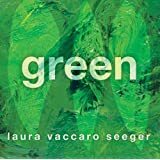 Her other honors include a show of her work at the Eric Carle Museum of Picture Book Art. A New York Times review of Mouse & Lion discusses varied interpretations of Aesop. About the author: A short biography of Nancy Elkhom Burkert appears on the blog We Too Were Children, Mr. Barrie. You can follow Jan (@janiceharayda) on Twitter by clicking on the “Follow” button at right. She is a novelist and award-winning critic who has been the book columnist for Glamour and book editor of the Plain Dealer.